The Cutting Edge of Ordinary: I'm Back! Stuffed Strawberries and the Fairy Hobmother Strikes again. It's time for you to make a wish! I'm Back! Stuffed Strawberries and the Fairy Hobmother Strikes again. It's time for you to make a wish! Hey I'm back. I told you I would be didn't I? First I have to tell you all about my Fairy Hobmother and that she could be your Fairy Hobmother too. My friend Amy from Very Culinary posted this awhile back. Go on and read it and you'll see that the Fairy Hobmother granted Amy her wish and she in turn got to help to grant a wish for one of her readers. Well I was one of those readers and I commented that I had recently burned my Lodge 6 quart Dutch Oven that I used for just about everything. I was really bummed about it and if I could have my wish I'd ask for a new Dutch oven. A few days later I get an email from the Fairy Hobmother telling me that she'd like to send me a new Dutch Oven. Are you kidding me? I really couldn't believe it but 2 days later this appeared at my door. 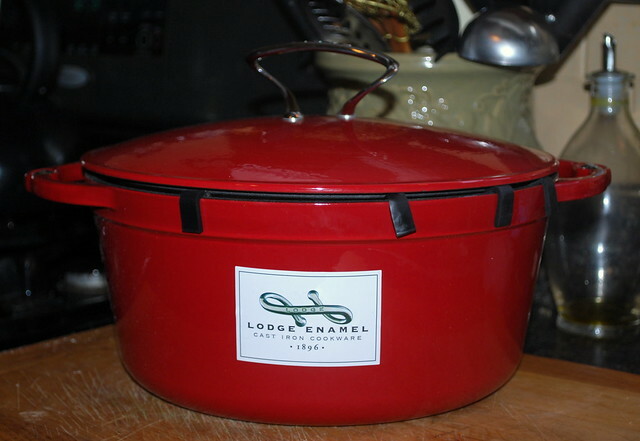 This gorgeous Lodge Dutch oven that was even better than the one I had! I was so tickled! All she asked me to do was to post about the gift and offer a chance for one of my reader to get their wish too! Ummm, yeah I think I can do that. So, this is for reals. Leave a comment and tell us your wish! You could be the next lucky winner. This could be the easiest no bake dessert on the planet. Ripe delicious berries stuffed with creamy/almondy filling and topped with chocolate coffee bean sugar. Simple but elegant enough for your foo-foo friends. (Foo-foo, that's what my friends and I call high flautin' folks. No worries, I don't have any of those kind of friends, lol). I bet when you first looked at those pics you thought "has the girl been away from the ktichen so long that she's gone and sprinkled her berries with pepper? Nah.. 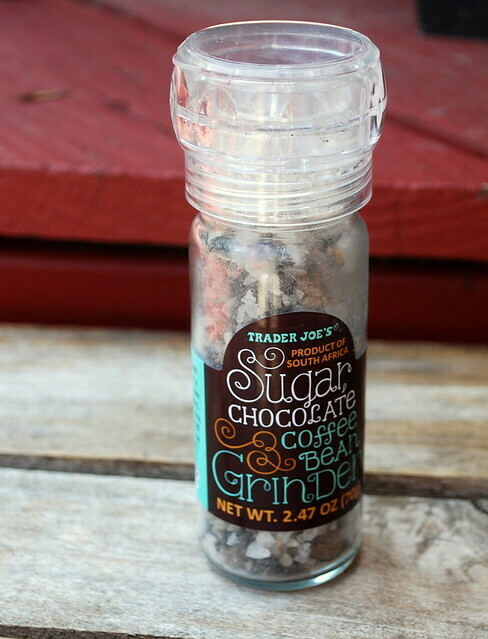 I found the chocolate coffee bean sugar grinder at Trader Joe's. See? You just grind the sugar onto whatever you fancy. In fact, I fancy this sugar so much that I think I'm going to have a sugar giveaway this week. That'll be coming up too! Ahhh, it feels good to be back. Combine the cream cheese, sugar and almond extract and mix well. Place mixture in a piping bag. Make criss-cross cuts in the narrow end of the berry, cutting about 3/4 of the way down, then pipe in the cheese. I used a Wilton 6B tip, a really big and wide one, and pushed the tip way down to the bottom of the berry and worked my way up. I left the stem on the berries cause I think it looks better and because it gives you something to grab onto when you are eating them. Chill until ready to serve. You could make these a day in advance too. Bad news that you burned your dutch oven--great news that this beauty came to replace it. How did it happen though? I've done unspeakable things to mine and it always seems to bounce back. I love the idea of wishes. In fact, I just suggested a wish to Mr. KC (which I am surely he promptly forgot) for a KitchenAid pasta maker kit. I love the idea of living in a world where fresh pasta is the rule not the exception. Jess...it was BBQ that was the culprit. It burned the bottom so bad I couldn't save it. I tried everything and I mean everything. Nothing worked. Now I have a shiney new pot. Me happy! I bake constantly (even making things for others to take to potluck dinners and pass off as their own creations) and every holiday season I bake treats for my family because I can't really afford to take part in the gifting. last time, my antique KitchenAid mixer broke. I'm still totally heartbroken about it. I'd love one of those Artisan mixers to replace it. I always thought of them as unattainable for someone in my income bracket, but who knows? wishes can come true sometimes! Oh, these strawberries look great! I've been needing a good, low-work dessert to add to a summer party menu. For my own wish, I've been wanting a good canning pot so I can make my own jams that don't have any high fructose corn syrup in them. You really have to hunt for them sometimes, and the Simply Fruit isn't a whole lot better. Homemade is the best. So excited about your new dutch oven! Can you even believe it? No strings attached. I wish it were always this easy to get new shiny objects delivered to our door. I might need to make these strawberries just for Trevor. And that chocolate coffee bean sugar grinder? *DED* The closest Trader Joe's to me is 40 minutes away. Waaaaa. These strawberries look so delicious! I wish they were here for my breakfast. My wish is something the fairy hobmother probably can't really do - that my girlfriend gets the job she interviewed for last week and that soon I can find a good job as well. We've been unemployed for a long while now and its getting rather old and exhausting. Strawberries look amazing. I am going to make them for Earl. They look like something that he would eat, seeing he is not eating much lately. I would wish for the Fairy Hobmother to bring my mom a new electric grain mill. She loves to make homemade breads and grinds her own wheat. The mill she has now is broken, spits flour all over the place, and roars louder than a jet engine. Please help! I wish for meat grinder and sausage stuffer attachments for my kitchenaid. I worry so much about the safety of the meat I eat and feed my loved ones, I'd love to be able to grind my own. 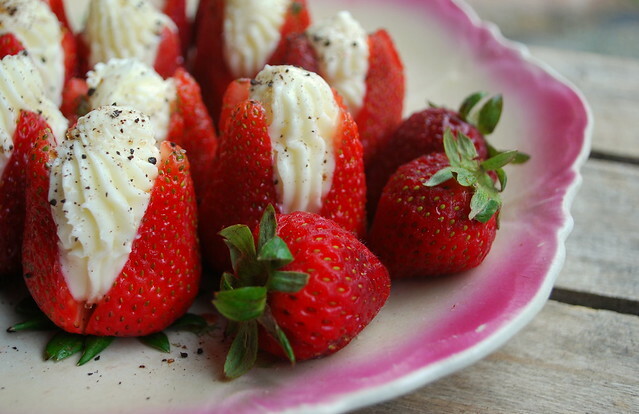 These strawberries look perfect on that plate. And yes, I thought they were sprinkled with pepper, which made me think the filling was somewhat savory and not sweet. goat cheese maybe? That grinder is so cool. I wish we had a TJ's here in Texas. The state is so dang big and yet NOTHING! My real wish though is to have a healthy baby in a few weeks. I know that's totally out of your control and I don't expect one to show up on my front porch. ha! Please grant someone else's wish and thank you for the offer. Enjoy your new dutch oven! So lovely! My sister was at a conference a while back and has talked about a dessert made like this ever since. I'm terribly green over that grinder you've got. Sure wish we had a TJ around here! Those strawberries are gorgeous. I would love one of those sugar grinders. I lived in Northern California and had many locations of Trader Joe's to choose from. Now in Colorado and there are NONE! Oh how I would love that red dutch oven sitting on my stove. What a beauty. I love making soups, beans, roasted chicken, pork and beef roasts, all requiring a dutch oven. Please Fairy Hobmother, hear my plea! I would love a set of glass mixing bowls. I have a very old set that I love but the glaze is cracking and they are starting to chip. I am petrified of breaking one. Love these Lisa. And so glad you got a new Dutch oven. That is spectacular. If I could have one wish right now? Hm. A stainless steel deep skillet. I bought one a while back before I really cooked enough to know what I would want and I idiotically chose one with no long handle, just two stubby side handles. So I'd definitely get an all-clad 12- or 14-inch deep skillet with a handle. Love the color on your brand-spanking new dutch oven! If I had a Fairy Hobmother, she would nod when I told her how much I longed for Chrome Metro shelving - like you can get at Menard's, Amazon, Home Depot, Lowe's, etc. We have this old beat up 1980's hand-me-down wooden bakers rack that we use. And, it's ugly and has takes up more room than it does store things. Shiny, industrial, functional. There's a place for it in our new "Jimmy John's Kitchen." But, my imagination is a bit more free-flowing than our budget right now. Sigh. So....whatcha gonna make in your new Dutch oven?! I have always wanted a dutch oven!!!! Probably a strange wish coming from a college student but I LOVE cooking!! I plan on getting married next year...this would be a great start to my kitchenware!! So happy you are back! 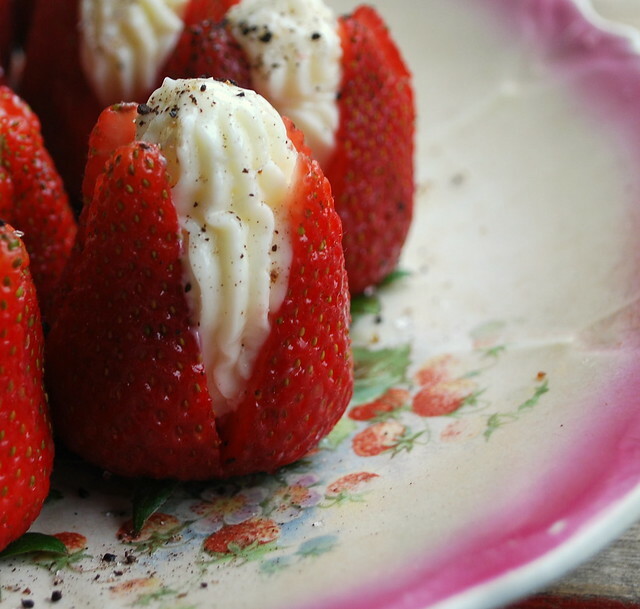 I have missed your recipes because they are always spot on - just like these strawberries! My daughter's 6th b'day is tomorrow and she kept saying she wants strawberries with whipped cream. So we made red velvet cupcakes and we were going to put some strawberries on top. Thinking I might make these instead and just put sprinkles on the cupcakes. She would absolutely love these. I have that grinder, too! Love it. My wish would be a new camera so I can take better pics for my blog. That is probably too big, so I will just wish that everyone else's wishes come true. Great looking pot! And very delish dessert... nothing like strawberries in the summer. A wish? Id wish for a professional grade stand mixer! I was a baker for 10 years so I never bought myself one! Im newly divorced and that would be such a treat! Wow-how cool to be gifted. We have a local radio station that encourages customers at Chik-fila to pay for the car after them. You can print out a "blessing" card and give it to the cashier to give to the next customer...just letting them know that they are "passing it on". The stories from the customers and cashiers on the radio are very inspiring!! If I could wish for something for my kitchen-it would be a Kitchen Aid mixer. Since my husband has been unemployed for 2 years (construction)-I have been cooking every day!! Thanks for the strawberries-they look DELICIOUS!! I wish the fairy hobmother would bring my family to me with the dutch oven =) My husband is in the military and we are stationed pretty far from home and seeing family is becoming a rare thing for us. So that would be my wish! That way I could cook them all a big meal when they got here. Until then I'll send them out to Trader Joes to find that sugar and ship it to me!! Oh, I'm putting that Trader Joe's grinder on my list! The closest one is over an hour away, but I stop in whenever I've got to be in the area. Loved them in CA, & so glad they've made it to NC. Two nights ago, I told my partner of my wish for a mixer, so I'd have to join the chorus for a Kitchen Aid. I am a strawberries and chocolate addict. I will try the recipe this weekend. Hi, I just found your blog from Tasty Kitchen. I was looking for a Pizza Dip. And, oh man! Does yours ever sound good! The stuffed strawberry looks unbelievable yummy, too! woah. 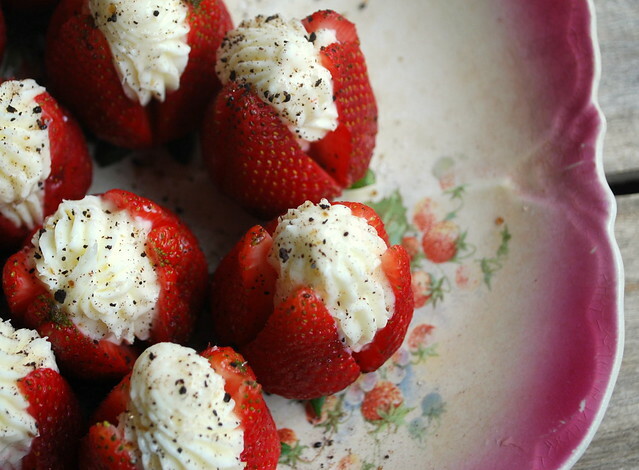 Strawberries + cheese + anything with coffee = amazing. Just made them. love love LOVE!!! Thank you, so easy to make and fun! Fairy hobmother, I would like to send my wish for a grain mill. Despite prestigious degrees (and a year teaching science just for fun) it took me two years to figure out that the giant size bag of bread flour from sam's was stored improperly and that's why all the bread, dough, crusts, sticks sucked. No gluten. Help me achieve bulk buying of raw ingredients while keeping them fresh! Don't let make another crappy loaf. (sob!). I just figured this out today. I am bummed. But seriously I would love a grain mill. Wr have a child with a horrible milk allergy and DIY a lot of our food. My wish would be for that gorgeous dutch oven, I have been trying to justify buying one. If it has to be a totally original wish it would be for a pasta attachments for my Kitchen aid Mixer. My honest wish..is to have one of those heavy grill skillets that leave those beautiful grill marks on perfect chicken without having to fire up the grill outside. Hmmmm what would I wish? A kitchen aid mixer. I had one that I had bought at a garage sale but it broke in Sept 2007. I LOVE to bake but haven't been able to very much for the past 3+ years, although I'm doing it more and more. Why? 3+ years ago, I found myself pregnant with a surprise baby at 41. =) Sadly, I developed HELLP (serious rapid onset pre-E that can be fatal to both mother & baby) & delivered him in Oct 2007 at 26 weeks. He was 1 lb 5 oz and 11 inches long. He spent over 130 days in the NICU. He still has some medical issues and has just started to talk but he is a joyful, happy 3 year old. Here is a link to a picture of him in the NICU and a couple months ago. I do still bake & cook more and more now that he is finally doing well and stable. I miss my mixer but I can never quite justify getting a new one. My wish would be to get a Kitchen Aid mixer, as a hand held mixer is troublesome for my arthritis, or a Cusinart ice cream machine so my son can make homemade ice cream. Thank you. You have wonderful blog. Found your site through Tasty Kitchen and I'm glad I did :) These strawberries look delicious! I love the addition of the chocolate coffee bean sugar on top, I'm hoping I can find that grinder because I don't live anywhere near a Trader's Joe! Every time I visit one of my favorite Blogs and I start reading the recipe directions...I hear the words Kitchen-Aid Mixer....Oh, to own one of those to try all those recipes!!! Then,I see one of the beautiful Dutch Ovens that is being given away but I have just missed out on getting my name in the pot. I think the colors on these pots are very appealing to the eyes. Good luck to everyone, as someone will be very happy with this pretty red pot!!! This looks delish, sorry about the dutch oven. My wish would be for a pasta machine, I've tried to make it on my own, but it doesn't come out great. Every few months I get a chance to catch up on my favorite blogs - life with a child of autism doesn't leave me much time. I have so many kitchen wants but if it came right down to it - an ipad for my little boy would make me the most happy. Never hurts to wish. I'm glad your wish came true.